500 Dunam on the Moon is a documentary about the Palestinian village of Ayn Hawd which was captured and depopulated by Israeli forces in the 1948 war and subsequently transformed into a Jewish artist's colony and renamed Ein Hod. It tells the story of the village's original inhabitants who, after expulsion, settled only 1.5 kilometers away in the outlying hills. Since Israeli law prevents Palestinian refugees from returning to their homes, the refugees of Ayn Hawd established a new village: “Ayn Hawd al-Jadida” (The New Ayn Hawd). Ayn Hawd al-Jadida is an unrecognized village, which means that it receives no services such as electricity, water, or an access road. Relations between the artists and the refugees are complex: unlike most Israelis, the residents of Ein Hod know the Palestinians who lived there before them, since the latter have worked as hired hands for the former. Unlike most Palestinian refugees, the residents of Ayn Hawd al-Jadida know the Israelis who now occupy their homes, the art they produce, and the peculiar ways they try to deal with the fact that their society was created upon the ruins of another. It echoes the story of indigenous peoples everywhere: oppression, resistance, and the struggle to negotiate the scars of the past with the needs of the present and the hopes for the future. Addressing the universal issues of colonization, landlessness, housing rights, gentrification, and cultural appropriation in the specific context of Israel/Palestine, 500 Dunam on the Moon documents the art of dispossession and the creativity of the dispossessed. 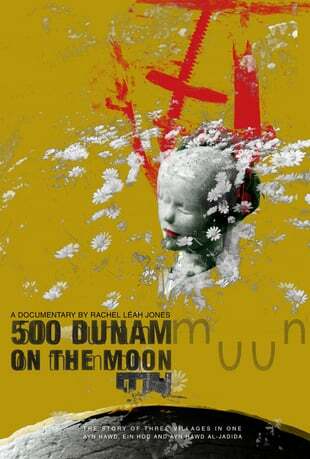 Rachel Leah Jones’s documentary 500 Dunam on the Moon unsettles the dominant Israeli narrative about the artists’ colony Ein Hod, founded in the wake of the dispossession of the Palestinian village Ayn Hawd, while giving the term “artists colony” an ironic twist. Within the film, the pictorial setting of the region does not serve a kind of a nostalgia for the exotic, but only highlights a multi-layered history of silence; the much glorified (“hod” of the Hebrew) hybrid architectural style that combines “East” and “West” has been literally built upon the ruins of Palestinian houses. Capturing this process from the perspective of the remaining Palestinian villagers, living on the outskirts of their old home, Jones’s film courageously puts the “present absentees” back, as it were, on the map. Of the many films in this year’s festival [Human Rights Watch] that deal with conflict in the Middle East, most seem to be sketches toward a movie... The exception is Rachel Leah Jones’ 500 Dunam on the Moon. Jones had the wit to seize on a revelatory topic for her picture and the patience to develop it fully. Rachel Leah Jones’ dispassionate tour of the village Ein Hod, nee Ayn Hawd, encapsulates the most bitter of Israel’s ironies: how a place of refuge created its own refugees. During the ongoing fever-pitched crisis in the Middle East, a film like 500 Dunam on the Moon seems essential... The movie is free of the usual rhetoric and hyperbole (from both sides), and shows one neighbor struggling along while the other prospers.